I took the domain igpay.com on February 21, 2000. I remember being excited to find an interesting 5 letter domain name was available and I think my original intent was to create some kind of Pig Latin educational site. By 2001, PayPal had started gaining popularity and I decided to pitch the site as a PayPal alternative. I loved the phrase “I pay with IGPAY!” I also took the domain pigpay.com just to be safe. 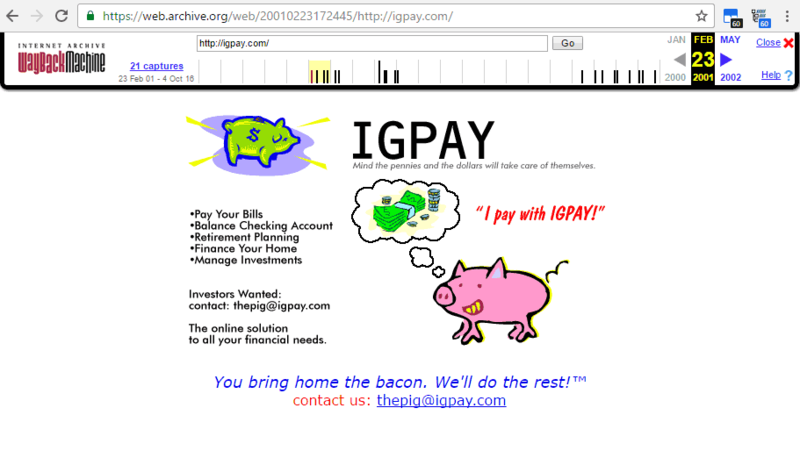 Screenshot from the Internet Archive of igpay.com. While I could see the potential for an integrated online money transfer system coupled with other financial services and bookkeeping, unfortunately, I had no idea how to implement it all. You bring home the bacon. We’ll do the rest! So, um, PayPal did kinda good “PayPal raised $70.2 million for its IPO.” and I held on to my 5-letter domain name waiting for some project that would be fitting. And that’s how my card game company came to be called igpay.com.